The Carl premium recycled rotary trimmer can cut up to 20 sheets of paper at any given time. With a patented locking rail mechanism and premium carbide blade that ensures a clean accurate cut, this 100% recycled trimmer has a metal base with a helpful mea Product number CUI12300. 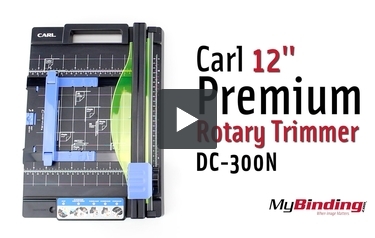 Transcript: This is the Carl 12 Inch Premium Rotary Trimmer! It has an adjustable edge guide that goes out all the way to an A4 size. It also locks in place. On the board it measures out almost to ten inches, or 25 centimeters. There are common paper sizes labeled as well. You’ll find more measurements next to the blade, labeled to 11 inches. Carl claims it cuts 20 sheets at a time, however, in the end it cuts closer to 15 in one pass. You can also do perforation, this goes through about 6 pages at a time. You can then fold the clean edge, or tear them apart. This is the Carl 12 Inch Premium Rotary Trimmer! You can store extra blades in the compartment here, there is also a section for extra cutting mats, which it comes with one extra and the two blades. To change the blade, turn the knob on the cutting head. Now, you can even do this in a way where you never touch the blade. Slip it into the cover which if done right, will hold it while you pull it away. Then put on the other blade like so. Again, you don’t have to touch the blade! Then turn the piece back into position. From time to time also change the cutting mat. But, do note that you can first rotate the pad for more use, then flip it, and even rotate it again for 4 total clean positions. It has a handle for easy transportation, and some basic rubber pads on the bottom. Can you please tell me what the dimensions of this cutter are, including the height? I want to see if it will fit in my drawer. Thank you. Thank you for your question. The Carl 12" Premium Rotary Trimmer measures 15.8 x 11.2 x 3.2 inches.